At J&M, we’re all about transparency with our Customers and establishing a standardized routine that guarantees top tier service on every HVAC Duct Cleaning Service we complete. Our Journeymen HVAC Duct Cleaning Technicians have quality service down to a science! It all starts with a brief phone call to our Office, where you will be asked how many Supply Vents (vents that supply air to the Home) and how many Return Air Vents (typically larger vents that circulate air back to the furnace) you have in your Home so we can give you a solid quote right then & there! Assuming you’re happy with the quote, our Office will schedule your HVAC System Duct Cleaning service on a day that works best for you. And don’t worry about being stuck at home all day waiting for the crew to arrive, our HVAC System Duct Cleaning Tech’s will give you a call with plenty of notice and a firm arrival time once they’re headed towards your home! 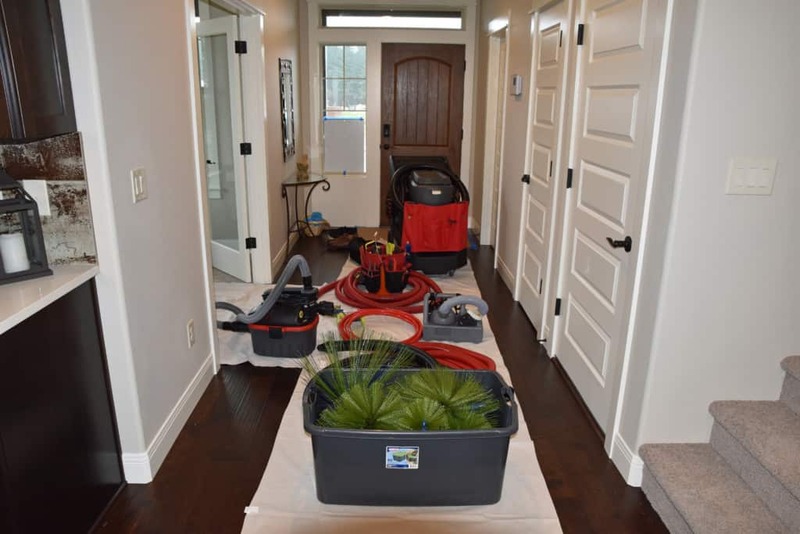 Upon arrival, our HVAC Duct Cleaning Technicians will introduce themselves and perform an initial walk-thru of your home to verify the location & sizes of all vents to be cleaned. If you happened to miss a vent during the count you gave our office, no worries! Our extremely affordable per-vent pricing ensures that even if there was a hard-to-see vent somewhere that you didn’t notice, any extra charges will be discussed with you prior to beginning work and will be very minimal. On the flip side, if you happened to guess high on your vent count, the Technician will adjust and lower your invoice accordingly per the exact number of vents to be cleaned! This goes hand in hand with our theme of full transparency at all times, no hidden fees and no cheesy sales gimmicks, just good old fashioned honest work. At this time, they will also offer to perform a full Crawl Inspection for FREE. 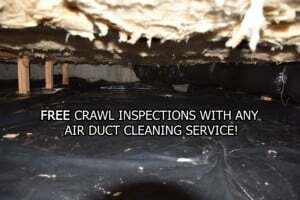 During the Crawl Inspection the Vent Cleaning Technician will assess & note any damaged ductwork, debris, loose insulation, potential wiring or plumbing issues, or anything else that should be brought to your attention. Minor duct repairs can typically be done during your HVAC duct cleaning appointment. Any larger duct work issues will be noted in detail so we can follow up with a quote, typically the next business day. If you aren’t interested in having any repairs done or know someone who can handle them for you, no problem. We promise from start to finish you’ll never see any pushy sales tactics from J&M Services! The first step is putting down drop cloths to make a safe place for all the tools & equipment required to clean your duct work. 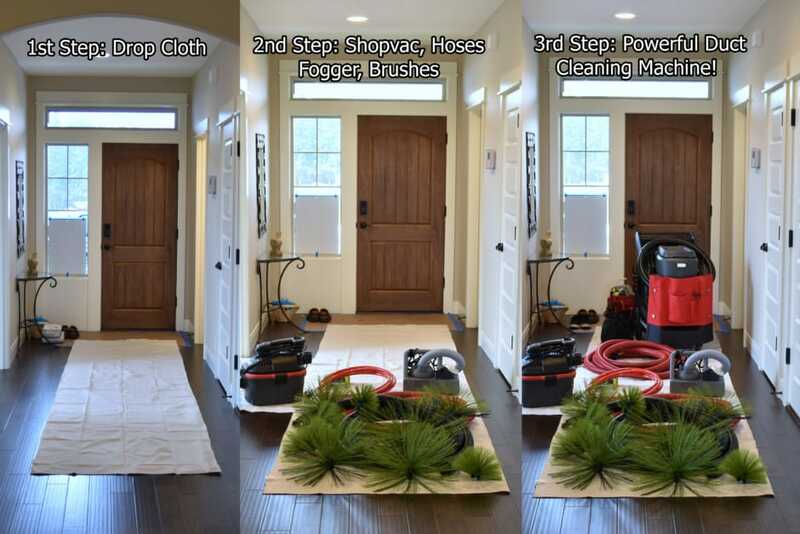 The Technician will have noted the HVAC duct sizes during his initial walk-thru and will bring in the required Specialized Duct Cleaning Brushes, hand tools, ladder(s), Shopvac with HEPA filter, industrial vacuum hoses, and of course our new RotoBrush BrushBeast Air Duct Cleaning Machines with FOUR powerful vacuum motors and HEPA filtration. The Vent Cleaning Technician will begin the actual cleaning process by first removing all the Grills & Registers and setting them aside to be washed. Drop cloths are placed in the work area, ensuring a clean workspace at all times while in your home. 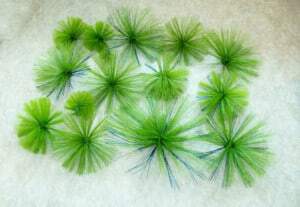 Specialized HVAC Duct Cleaning brushes are designed to fit every size of duct in your Home! The Vent Cleaning Technician will attach the corresponding size HVAC Duct Cleaning Brush to the end of the industrial vacuum hose, where a drive cable will spin the brush at a controlled speed of 450 RPM. The HVAC Duct Cleaning Brushes are made tough enough to knock loose any dirt or stuck on debris inside the duct, but soft enough to never worry about damaging flexible ductwork. The vacuum port is directly behind the spinning Duct Cleaning Brush, ensuring contaminants knocked loose are quickly sucked up into the powerful vacuum system. The Technician will make several passes thru the entire length of each duct in your home, only moving onto the next vent when they are absolutely certain the duct is completely cleaned! The Grills & Registers that were removed earlier will be hand washed. The Technician may ask if you have a laundry sink or bathtub they can use, but if that’s not an option they will clean the vent covers outside in a container. Once your entire duct system has been cleaned including a topical cleaning of the furnace itself, the Technician will re-install all Grills & Registers and offer to install a new Furnace filter if you have provided one. All tools & equipment will be loaded back into our vans, and the Technician will perform a final walk-thru to make sure not even a hint of our visit was left behind, other than clean ducts of course! At J&M Air Duct Cleaning Services, we’ve always believed in full transparency with our Customers since day one. We’re all regular folks, just like you. And just like you, we’ve had our fill of pushy sales tactics and sneaky hidden charges. We welcome and encourage you to ask the Technicians to go over all final invoicing with you. If you ever feel like something doesn’t seem right, please don’t hesitate to email here or call us directly at 503-680-0195 and ask to speak with the Owner of the Company. At J&M, we literally put our names on the line, J&M = Jeremiah & Michelle. We expect our family of skilled HVAC Cleaning Technicians to treat each Customer with the same respect and full transparency as we did when we first started our Family Company and handled each job personally. Hopefully you found this article informative. We’ve got a few more you might also enjoy! Is Air Duct Cleaning Really Worth It? 5 reasons why or why not! Protect yourself and your wallet! Beware of Air Duct Cleaning Scams!! Great post and thanks again for doing such quality work for your customers with our equipment. You have been in the business a long time and that is because you are a great business owner and take a lot of pride in what you do. As always, let me know if you need anything and I look forward to our chats. certainly like your web-site but you need to test the spelling on several of your posts. Several of them are rife with spelling issues and I in finding it very troublesome to inform the reality on the other hand I will surely come again again. What i do not understood is if truth be told how you are not really much more well-appreciated than you may be now. You are so intelligent. You recognize thus significantly in the case of this subject, made me personally consider it from a lot of various angles. Its like women and men aren’t fascinated until it is something to accomplish with Girl gaga! Your individual stuffs nice. All the time care for it up! of course like your web site but you need to test the spelling on quite a few of your posts. A number of them are rife with spelling issues and I to find it very bothersome to inform the truth nevertheless I’ll certainly come again again.